I cut the fabric for these and made one up. I’m not crazy about these. But since I cut the fabric and got everything prepared, I went ahead and finished them up. Maybe someone will like them. 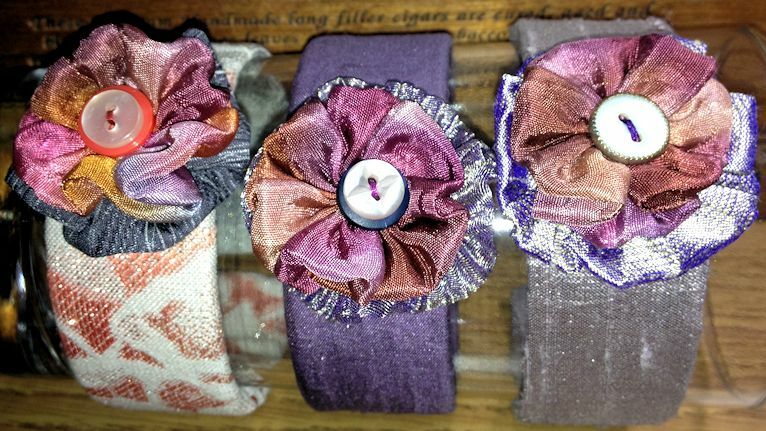 They are made out of hand dyed rayon velvet and cotton batik fabric. I backed them with wool felt flowers. 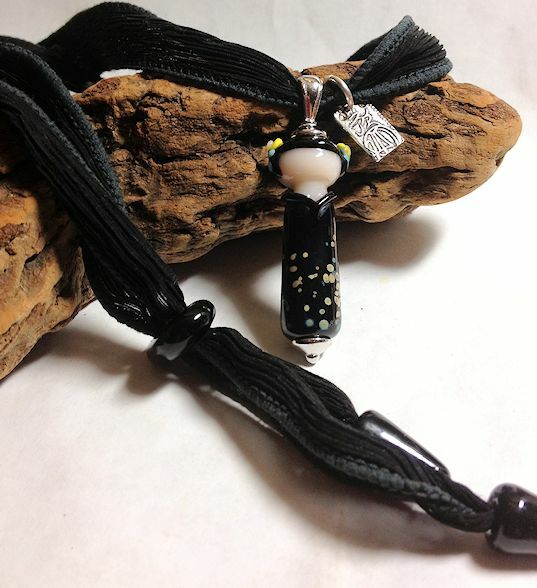 I used a black silk ribbon on this one. I made the glass end caps and button clasp to make the length of the necklace adjustable. These buttons work out well and don’t slide around but can be moved easily. I got five more bracelets done. They are really easy and fun to wear. 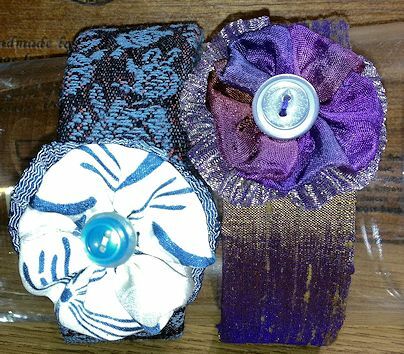 The slap bracelets are covered with fabric, then I add a yoyo flower that is made out of fabric and/or ribbon. The reason all of them are on the purple side is because I bought a silk fabric pack as I wasn’t planning on making more than one for myself. It turned out so cute that I thought I’d make a few to sell. 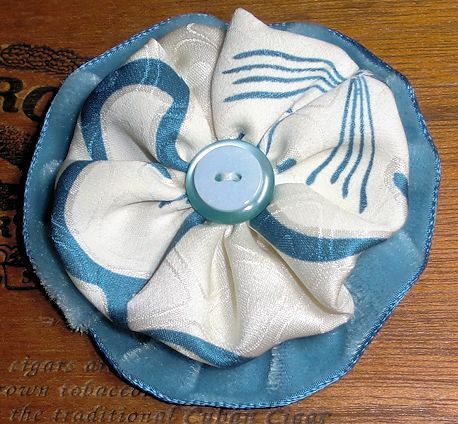 Here’s another flower pin I just finished. It’s got vintage velvet ribbon on the bottom and Japanese silk fabric on the top. Kind of plain but looks great on prints. 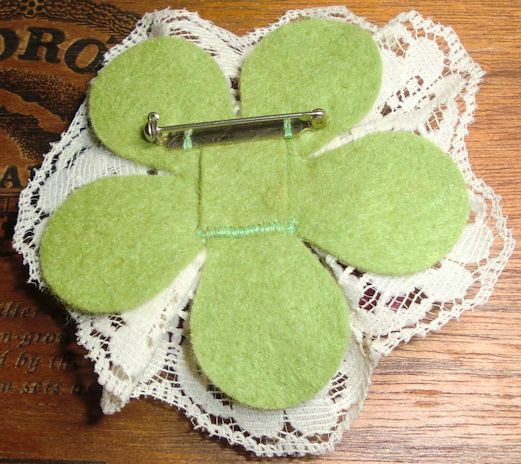 There is also a little loop so the flower can be strung on cording or whatever. This is my first attempt. It’s about 2 inches across. I had some diecut felt flowers that I used for the back. 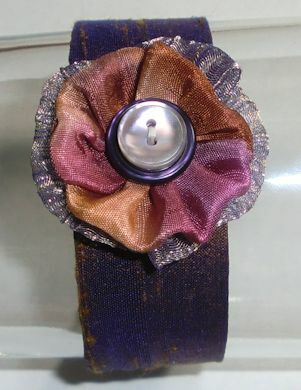 I added a little tab so the flower can be threaded onto a hairband or ribbon. Two views of the same bracelet. The flower is about 1 1/2 inch across. I made a fabric sleeve and sewed the flower onto the sleeve, then inserted the slap bracelet and sewed up the end. Here’s the last two ladder bracelets I made. These will be the last I make before the craft show. They have been a hit this season. The are going with the spacer beads I made in a previous post. These have silver leaf in them to give them some sparkle. Of course I can’t go a weekend without making beads. I’m cleaning up all my short ends of glass again and I made these simple encased beads. And I couldn’t go without making a few buttons. I’m still working on flower implosions. Okay, this is it on the little people figures. They are fun but I don’t have the time to play around right now. 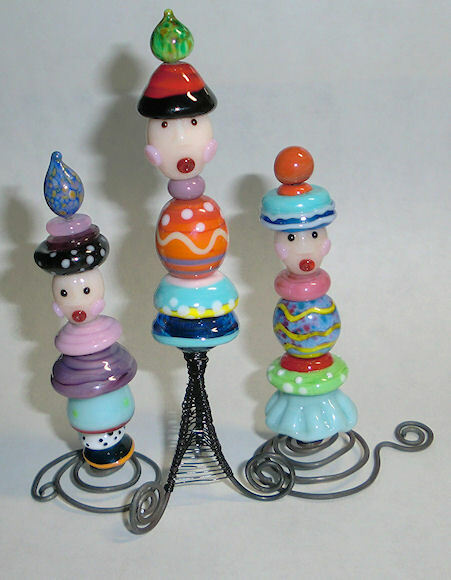 I need to be making things that I can sell at the next craft show. And I’ve finally made enough buttons for the button swap that I joined. I only need 10 for the swap but I must have about 30 of them left. Some aren’t so nice, others I don’t want to part with. Here’s the ones I made this weekend. More floral implosions. I’m still working on the petals and the left one doesn’t show up that well. It’s the frit I used on the back of it. I think I’m getting better with the petals. Still need practice but I’m getting there. Some more striped buttons. I really like making these in all different colors. I thought I was done making buttons but decided to spend another day making them so I have a good number of them for the button swap I joined. 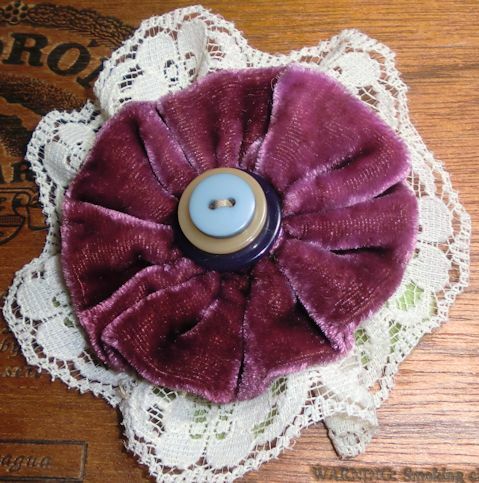 Still working on the flower implosions and other buttons. I’m still trying to figure out how to control the flower implosion so they turn out centered and looking like flowers. I still need lots of practice. Guess I’ll be making more tonight.